First, there was a violent shock. Then, there was the roar of a 30-foot-high wave of water, throwing fish onto a sandbar in what is now North Dakota. Then there was a hail of molten rock, pelting dying fish and soon-to-be-dying land creatures. Then the fires began. 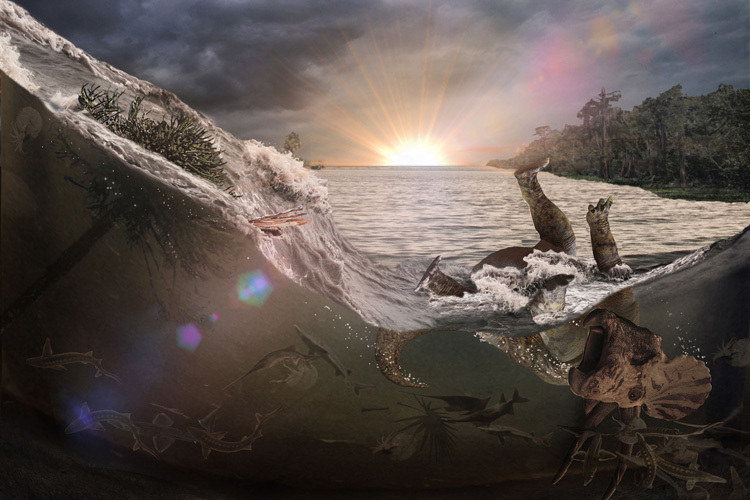 That’s how the doom of the dinosaurs began, nearly 66 million years ago, according to a study to be published in the Proceedings of the National Academy of Sciences next week. This entry was posted in GeekWire and tagged Asteroids, Dinosaurs, Geology, Science, University of Washington. Bookmark the permalink.